Based in Chester I will travel throughout the UK and abroad to offer a professional service at any occasion, to ensure that the host of the event can relax, knowing that everything will run on time with the right people, at the right place, at the right time and ensure all third party suppliers work as a team ensuring the event is a huge success. Don’t leave things to chance, employ Chris to ensure your event runs as planned and your guests go away having had the time of their life. As a Wedding Celebrant I can offer you the Wedding Ceremony that you want. With a Civil Registrars ceremony you are very restricted to what YOU can do. Not so with me! What is not so commonly known or understood in this country – is that ONLY the Declaratory Words and the Contracting Words have to be said in a Registry Office, in order for your marriage to be recognised in law and for a marriage certificate to be issued. This can be done before your big day! My role at the event is to ensure we raise the maximum amount of money for your chosen charity. Selling raffle tickets, running any games or auction; if it can be done I will do it!! You will have invested a lot of time and money into the planning of the event and by investing in me you can rest assured that your event will be in very safe hands. Any event requires considerable planning and financial investment before your first guest walks through the door. By employing me as your Toastmaster and Master of Ceremonies I will ensure your guests enjoy the event in the manner and style that they would expect from such an organiser as yourself. You want your day to be perfect, well so do I!! By employing me, as your Toastmaster to project manage your big day, you can relax and enjoy the happiest day of your life. I have been a Professional Toastmaster for over 12 years and have worked throughout the UK and abroad. My seven years’ service in HM Royal Marines taught me the importance of good planning and preparation before any event and also the skills to interact in a professional manner with everyone involved. I am happy to travel anywhere in the UK or abroad to assist at weddings, dinners, charity events, corporate functions or special family events. You want your event perfect, well so do I. 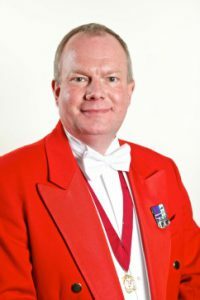 Based in Chester, Chris Caroe covers the North West of England and North Wales including Cheshire, Merseyside, Lancashire, Manchester and Shropshire as a Professional Toastmaster. Chris is happy to travel so please do contact him and discuss your plans with him. To contact Chris please call using the numbers below or using the contact form on this page.